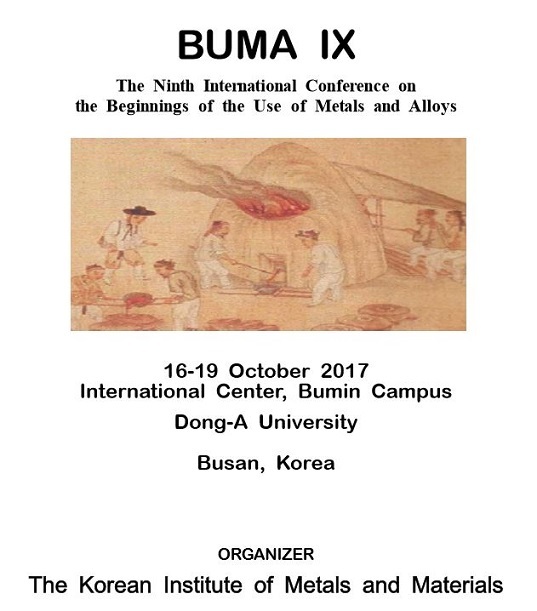 BUMA was founded in 1981 by two eminent archaeometallurgists, Prof. Robert Maddin in Philadelphia, USA and Prof Tsun Ko in Beijing, China, with the strong support of late Professors Cyril Stanley Smith (MIT) and Yunoshin Imai (Tohoku University) from the second Conference on. From Beijing in 1981 BUMA has traveled to Zhengzhou, China (1986), Sanmenxia, China (1992), Matsue, Japan (1998), Gyeongju, Korea (2002), Beijing, China (2006), Bangalore, India (2009). Nara, Japan(2013). BUMA IX will be held in Busan, Korea in 2017. As the largest harbor of Korea, there are many historical and cultural attractions in Busan. The main theme at the Busan Conference is “Cultural Interaction and the Use of Metals”. The Conference will provide a forum for discussion on the effects of metals on the culture and history with a special focus on Asian materials. Comparative studies and case studies on ancient and traditional metallurgy from other regions can illuminate the interactions between the Far East and the West through South Asia as well as Eurasia. (9) Experimental Metallurgy, Survey Methods and ConservationThe international conference on “the Beginnings of the Use of Metals and Alloys” (BUMA) is the interdisciplinary gathering of scientists, engineers, archaeologists and historians with a focus on production and use of metals, and an emphasis on cultural interactions and evolutions over time and space especially between the West and the Asian region. ※ If you need additional information, Please find the attached file.